In stock 26 pcs. Also available in our walk-in store. 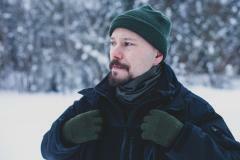 Simple dark green wool gloves. Probably meant to be used as liner gloves, but what stops you from using these as they are? Belgian army surplus, and in totally unissued condition, these were not used to put indigenous peoples down. Made of 100 % wool to the best of our knowledge. Wash in 30 °Celsius. Only size "2", which seems to be about Small-Medium - fits size 8, maybe even size 9 hands. Vahvan tuntuiset sormikkaat jotka sopivat hyvin pikku kätösiini. Ajattelin pitää näitä belgialaisten nahkahanskojen alla. Size 9 is a bit pushing it since the palm area of the glove is shorter. You can still wear them though, but the wrist part rides high on your palm, feels a bit weird. For smaller hands, they are perfect, nothing to complain. Excellent gloves! 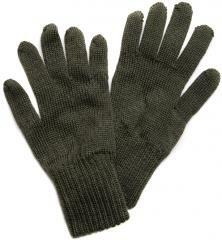 There is nothing like a nice pair of surplus wool gloves! Very happy with the purchase! Hyvät villasormikkaat, kestävän oloiset. Ei maailman lämpöisimmät, mutta riittävän lämpöiset, eiväthän nämä merinoa olekaan. Omaan about 8,5 käteen just sopiva. Ovat olleet käytössä alushanskoina viime syksystä lähtien, eikä mitään valittamisen aihetta ole ilmennyt – tuntuvat kestäviltä, lämmittävät tarpeeksi ja istuvat oikein napakasti n. koon 7,5–8 kokoisiin kätösiini. Super well made gloves. 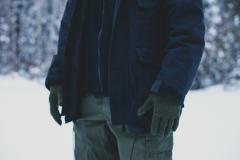 Better than all the rest of the mil-surplus wool gloves of this style I have seen, even the Sarma ones which I have a pair of, very nice! ...These are small though. I wear a 9-9.5 and these are not wearable. If you have have smaller hands, these would be awesome and I would buy at least 5 pair. Good to give to your wife/girlfriend, they’re a bit small. Very, very small glove. They barely fit me and I'm a size 8. On the plus size, these bad boys actually fit under my motorcycle gloves, meaning I can push my summer gloves all year in Texas! High quality, definitely recommend if you have small hands or need a proper liner glove. A little bit small but great for liner gloves. 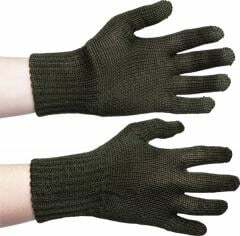 i wear them under my work gloves and they work great for that. A local store in Canada sells Canadian ones for $15 a pair but these are the exact same.